The Velvet Box has great curation of junk jewellery. You'll get everything on this account, nose clips, danglers, neckpieces, chunky rings, mirror jewellery and what not. Also, they have a great range of Afghani jewellery as well. 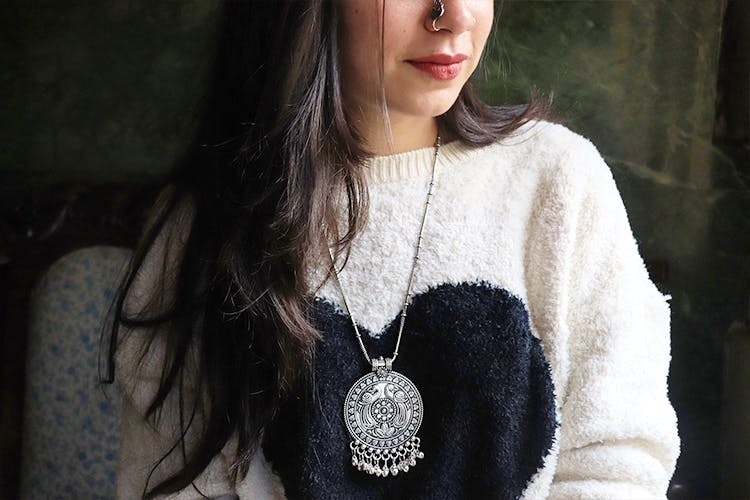 I personally love their mirror-work, very banjara-style, silver coloured jewellery- it goes well with everything, and also lasts really long. PS: You can shop the LBB Special to get these at an even more discounted price. You can give a miss to your next Janpath visit and order some awesome stuff from this account. The rates are almost the same. And the best part, their delivery in Delhi takes at most two days! Follow The Velvet Box on Instagram or shop their special curation for LBB.